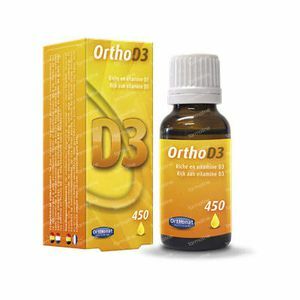 Orthonat Ortho D3 20 ml order online. Vitamin D is synthesised in the skin as a result of exposure to the sun’s UVB rays. It is highly recommended that we profit as much as we can from the beneficial effects of the sun between April and October by encouraging outdoor activity. We cannot always benefit from sunshine at our latitude, but vitamin D can also be obtained by eating foods that contain vitamin D such as fatty fish, egg yolks and liver. Vitamin D is important for teenagers as it plays an essential role in fixing calcium. The peak in bone density that will determine the solidity of bones later on takes place at around the age of 20. Teenagers today prefer indoor activities (PC, video games, etc.) and don’t get much outdoor physical activity which stimulates the synthesis of vitamin D.
Moreover, vitamin D plays a role in cell division. Given the very important role played by vitamine D and the lack of sunshine in our region, taking Ortho Bio D3 can be an important factor in maintaining a healthy and balanced lifestyle. Consume 1 drop of the Orthonat Ortho D3 each day during the meal.